If you're looking to find, hook and get a guy to commit in ten days, look no further. 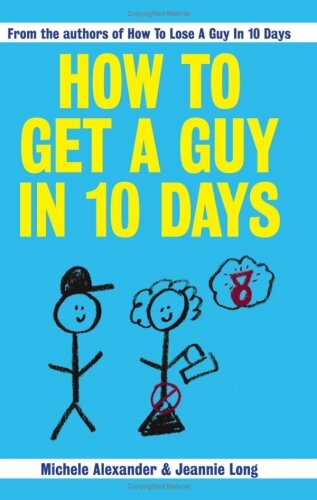 The writers of How To Lose A Guy In 10 Days and How To Tell He's Not The One in 10 Days are back with an all new guide - and this time, it's a surefire winner. From making sure he knows you're a marathon runner (even if you're not), to turning off your phone when you know he's going to caIf you're looking to find, hook and get a guy to commit in ten days, look no further. The writers of How To Lose A Guy In 10 Days and How To Tell He's Not The One in 10 Days are back with an all new guide - and this time, it's a surefire winner. From making sure he knows you're a marathon runner (even if you're not), to turning off your phone when you know he's going to call - the answers are here. It's just up to you to use them. From day one to day ten we'll walk you through the lighter side of finding a boyfriend using the old fashioned, time honored tricks of misrepresentation, unavailability and mind games! This book helped me get with my boyfriend William.